It was nice to see this busy guy. He came from a whole day of taping, a bit tired and weary. He's hardworking that's why when he came out on stage, it didn't look like that at all. The attention and popularity he's gotten from the kalyeserye of course have made him a household name, even bigger than he expected. Now, Eat Bulaga has erased the competition in ratings, he's got tons of people adoring him and perhaps a love life looming in the horizon. I don't know anyone who doesn't love #AlDub these days and just like every person who has believed Alden Richards will have his time to shine, this one was almost blinding! Yes, this was one of the reasons why he was so thankful when we talked to him during that evening at the Music Museum when he was revealed as the face for YES, popular brand Boardwalk's Young Emerging Sociopreneurs. 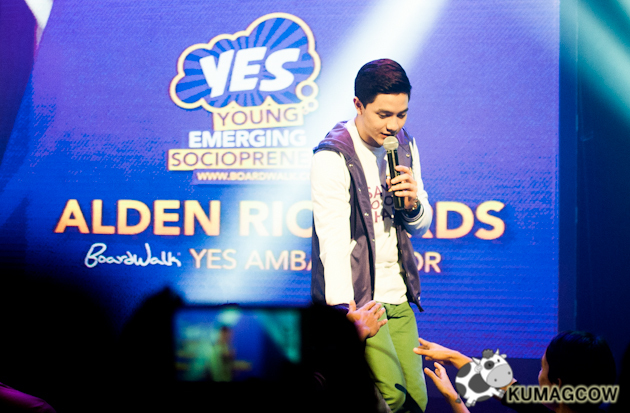 To say that the crowd went wild is but an understatement, they went ballistic when Alden went near the edge of the stage. Hugs and kisses, I've heard of stories but I heard them on the mic during that evening. I'm glad Alden didn't get hurt but imagine how it would have been if he was outside on the streets, people probably would go equally crazy as well. 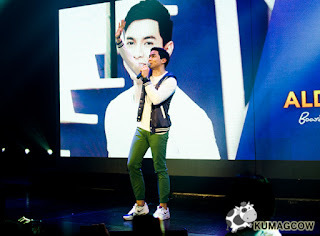 Alden Richards wanted to entertain the crowd so he sang one number and we got that on video. 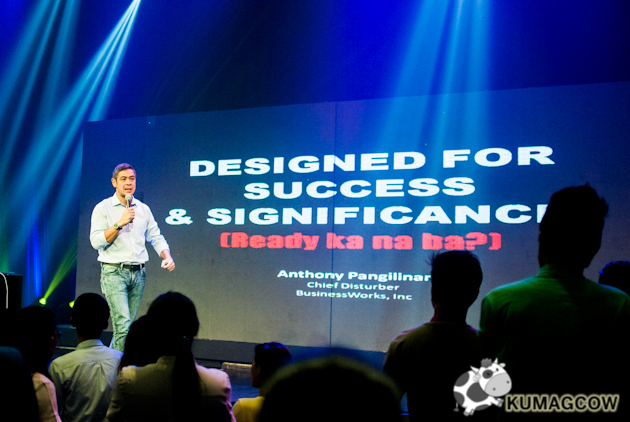 Aside from that, he said a few words to the students and young entrepreneurs. He also said thanks to the Boardwalk family for believing in him back then when he was just starting and he also mentioned that the company isn't just a sponsor, but he felt they were like family. Boardwalk also believes in making the Filipino be a part of their dream and they had several awardees, outstanding leaders on stage to say their piece so the attendees would get pointers, get inspired of what hard work can do. Alden even made that cute little gesture he does called "Pabebe Wave" and the response from people was just ecstatic. 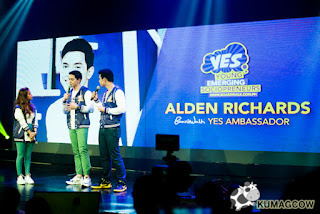 Here's the interview we did with Alden on video. 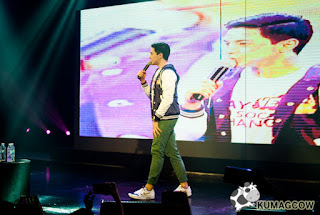 Watch Alden sing and serenade the crowd, how deep is your love? Check out how Alden Richards feel as a new Twitter Millionaire. 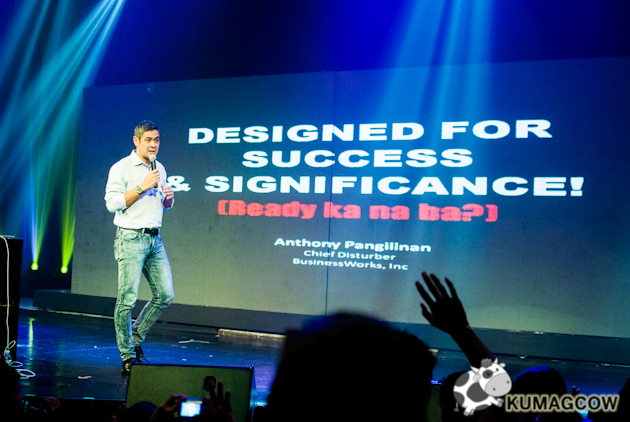 Anthony Pangilinan also had a talk and inspired so many young individuals that evening. Boardwalk has been making these guys and gals be marketing geniuses this early, I'm sure they'll be extremely successful sociopreneurs as they become catalysts in economic stability in the country, add to that the social impact they'll have in their own schools and communities. 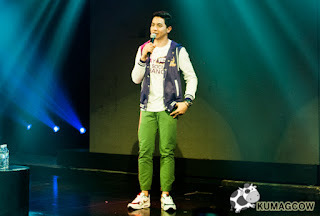 Alden Richards must be really proud to be part of the Boardwalk family. He's blessed because he's definitely worked hard for it. I hope his story also becomes an inspiration to those who would want to be successful in their chosen fields. AlDub all the way!